Boylesports is one of the largest and most popular fixed odds bookmakers in Ireland. While many still consider it to be a small company, it actually commands a massive share of the Irish betting market. In addition to the website, Boylesports operates over 160 betting shops. Furthermore in 2008 the Football Association of Ireland announced that Boylesports was their new Official Betting Partner. The website is available in a number of languages and will accept most major currencies. Boylesports regularly attracts customers from across the UK, Europe, Scandinavia and Australia. There are betting markets available on close to 30 different sports including: American football, athletics, Aussie rules, baseball, basketball, boxing, cricket, cycling, darts, field hockey, futsal, Gaelic sports, golf, greyhound racing, handball, horse racing, ice hockey, martial arts, motor racing, pool, rugby, snooker, soccer, table tennis and tennis. There is an impressive Live Radio section on the Boylesports website. It offers a number of channels which are packed with information. Horse racing fans can enjoy a dedication channel which streams live previews and commentaries from race meetings across the UK and Ireland. The commentaries are provided in a race-by-race format and there is also a three-day commentary archive available. There are similar channels available for football and greyhound racing as well as special Sky Sports broadcasts to cover all the weekend Premier League action. The best option is to use these channels in conjunction with Live Betting to really stay ahead of the game. Boylesports has a fantastic mobile application which is compatible with all major mobile devices (iOS, Android and other java based devices). Without a doubt, the best feature of the mobile app is that all the betting markets that Boylesports offers are available. Furthermore, the intuitive user interface makes it very quick and easy to place a bet. The app not only provides access to upcoming markets, but also features forecast and tricast betting on a number of races. This has made it particularly popular with horse racing and greyhound racing fans. What really rounds the app off is the ability to easily make deposits and withdrawals from your account. This means that you can have complete control of your bets while on the move and never need to miss out on a good set of odds. What do you do if you feel like placing a bet, but there is nothing on? This is where the Boylesports website can step in and fill a gap. It recently launched a Virtual Racing section. Here you can find a number of virtual sporting events including horse racing, cycling, speedway, tennis and football. You can watch the computer simulated games and races and bet on them just as if they were real events. The graphics are great fun and really draw you into the action, and with so many virtual events taking place every day there is always something worth a flutter. A really nice feature of the Boylesports website is that it is possible to access customer support without being distracted from your betting. Customers can carry on watching and betting on live sporting events while still using the site’s customer service interface. The live chat team is on call 24/7 and treat every query as quickly and effectively as possible. In addition to the live chat, Boylesports can be contacted through email, telephone and fax. The customer support team is fast and efficient and never fails to demonstrate an in-depth knowledge of the site and how it operates. However, the site’s live chat facility is its best feature. The online customer support team is available 24/7 to answer your questions or concerns. The customer support team’s sense of urgency when it comes to solving problems or issues never fails to satisfy its users. Boylesports offers a variety of payment methods all of which are fast, secure and stress-free. However, compared to other bookies there are a few limitations. The minimum deposit is €10 and the site only accepts Euros, Great British Pounds and US dollars. Nonetheless, the site offers enough payment options to satisfy the vast majority of punters and will quickly process payments through any of the major credit and debit card companies (MasterCard, Visa, Visa Electron, Solo, Laser and Visa Debit), bank transfer and cheque. It also accepts payment through a number of eWallets including PayPal, PaySafeCard, Moneybookers (Skrill), Neteller. WhoIsTheBestBookmaker.co.uk would highly commend Boylesports to anyone from the UK and Ireland. Players from the rest of Europe may find the site slightly limited as a number of promotions won’t be available. Nonetheless punters will find consistently great odds which often make up for the promotions. 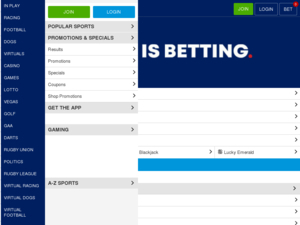 The mobile app is a great bonus, and combined with the live betting service and in-depth commentaries available, it definitely makes Boylesport an excellent betting destination.